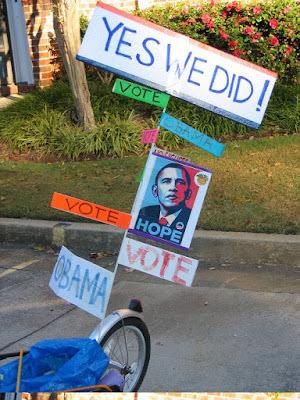 Thanks to my friend and fellow bicycle advocate, Sara Fuchs, she I and the Obama Obicycle were strategically positioned at the election night party at Manuel's Tavern. Among the revelers and news hounds snapping our picture was Jessica McGowan of the Atlanta Journal Constitution, who got a photo of me with the bike included in this Atlanta Reacts Tuesday photo-stream (number 23, last time I checked). Although work for the campaign is thankfully done, I decided to outfit the Obicycle with a last celebratory sign and do a victory lap or two around intown Atlanta. It will be a fitting tribute to the Obicycle before it's retired at the end of the week. Congratulations to us all for being part of this historic victory! Also, very special congratulations go out to my niece Hilary and her husband Javier who welcomed their new daughter, Luna Eden Fernandez, into this world last night at the exact moment polls were closing on the East Coast, making her, perhaps, this nation's first Obama Obaby. When will we see the Martinmobile? Wahoo! Thanks for taking us on the Obama victory journey with you Marc--what a wild and fun ride to the White House!